Nicoleta grew up in Soroca, a small city in Moldavia, Romania’s eastern neighbour. 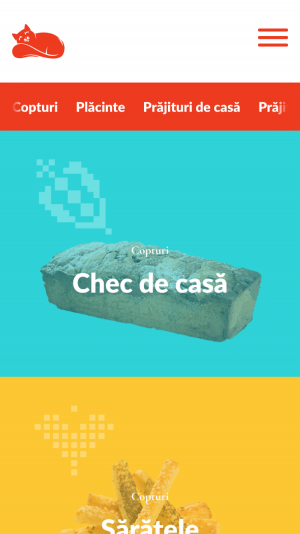 She came to Iasi and brought with her the recipes that she learned from her mother and grandmother and delighted her childhood. 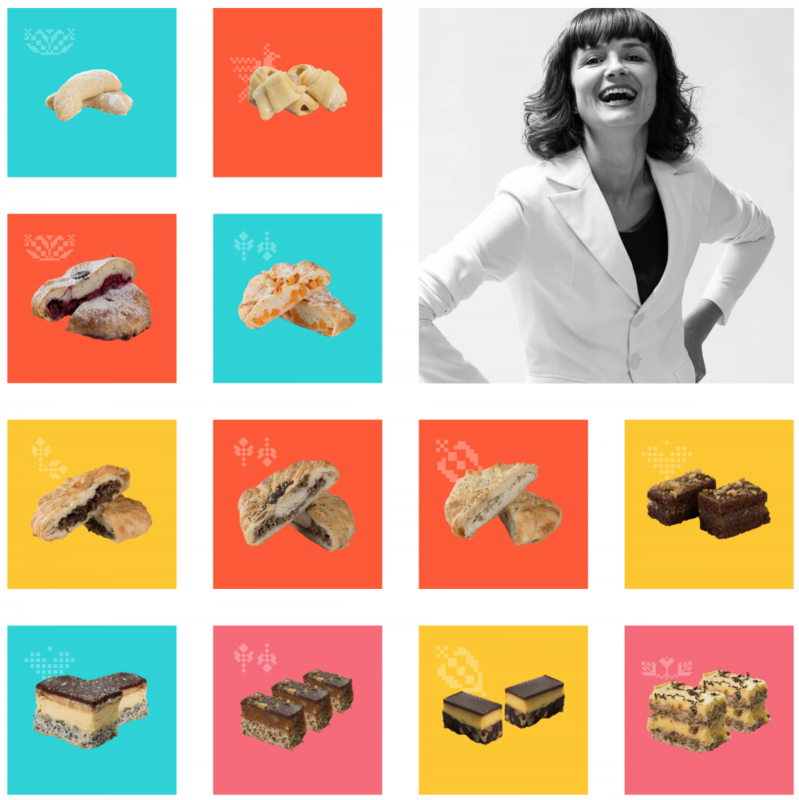 She wanted to share her love for healthy and responsible baking so she started Cuptorul Moldovencei, a local chain of bakeries selling fresh, delicious products, made with only healthy ingredients. Pies, cookies, cakes and sweets find their way to happy customers daily, through four very warm and welcoming locations in Iasi. 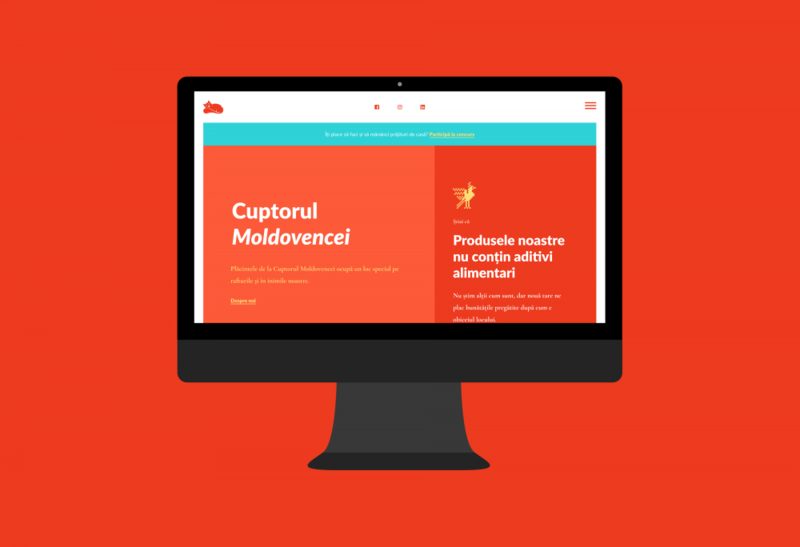 They commisioned us with designing and developing their new website and we were excited to do it. In order to have the user in mind, we had to define, as detailed as we could, the target market. For this we created three personas and described each of the following aspects for them: motivations, objectives, necessities, frustrations. We now had a clear idea of who our users were, what their desires were so we could meet them. 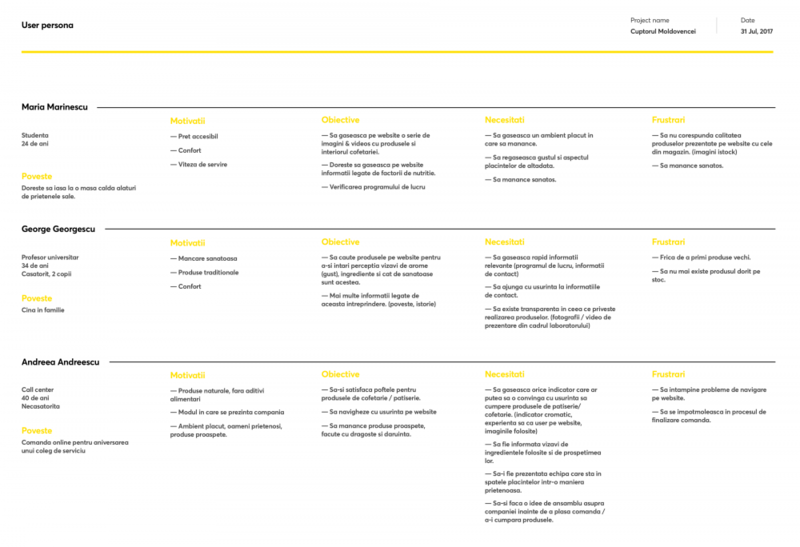 Outlining the sitemap gave us a clear view on what the pages were and how we needed to structure the content. That was followed by building the information architecture so we would know what content is needed where, and how to make it accessible fast and easy for our users. This website would turn out to be a pretty simple one, with a small number of pages, but we never ignore the sitemap and IA steps because precious insights can always emerge. 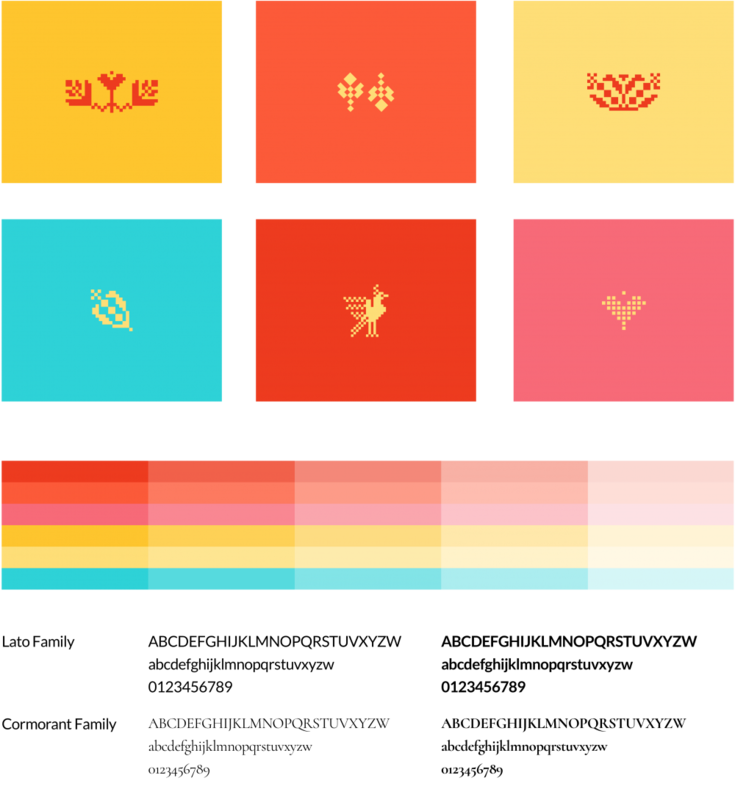 As mentioned, we didn’t want this to have too much of a traditional outdated feel, but we needed to include elements inspired from local moldavian folklore. 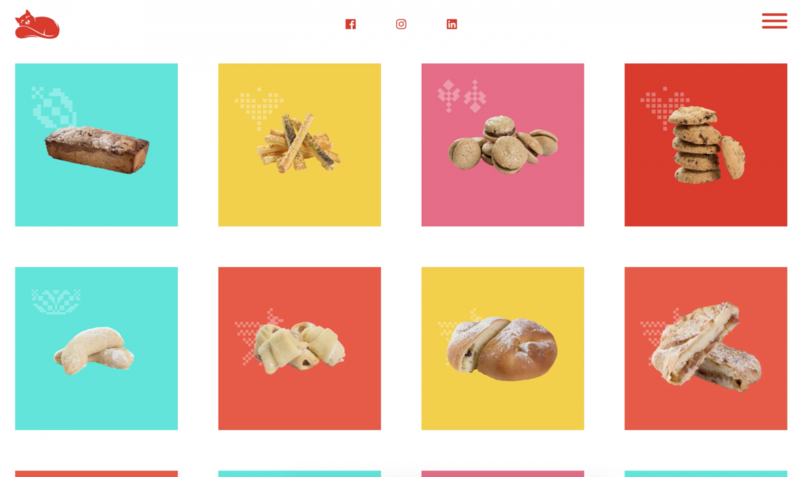 We designed graphical elements that support the look and feel of the brand, and sprinkled them strategically throughout the website. These are accompanied by a energetic colour palette and a mix between two font families, Lato and Cormorant, a serif and a sans serif that further enhance the eclectic approach. It all came to together in a responsive new website, designed to speak volumes about what the brand is about. We coordinated and edited the photography for the products, creating consistent layouts throughout. 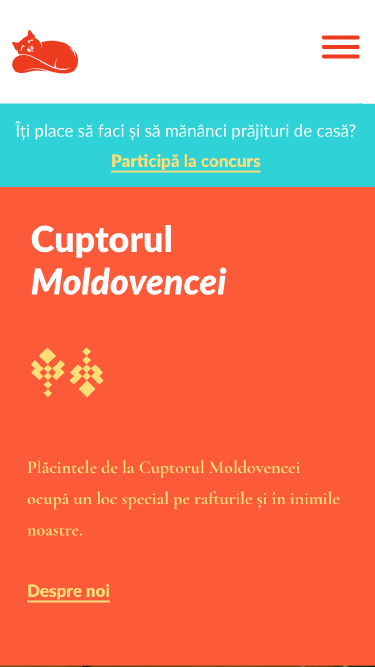 We created a contest landing page and a blog that Cuptorul Moldovencei would use for content marketing. We decided to bring the social media buttons on top and opted for a burger menu for desktop display because their activity on social media is a really important part of the marketing effort. Each product is a star so the gallery combines different color cards with photography and moldavian inspired graphics. We also designed attractive microinteractions that you can see by clicking the video on the left. 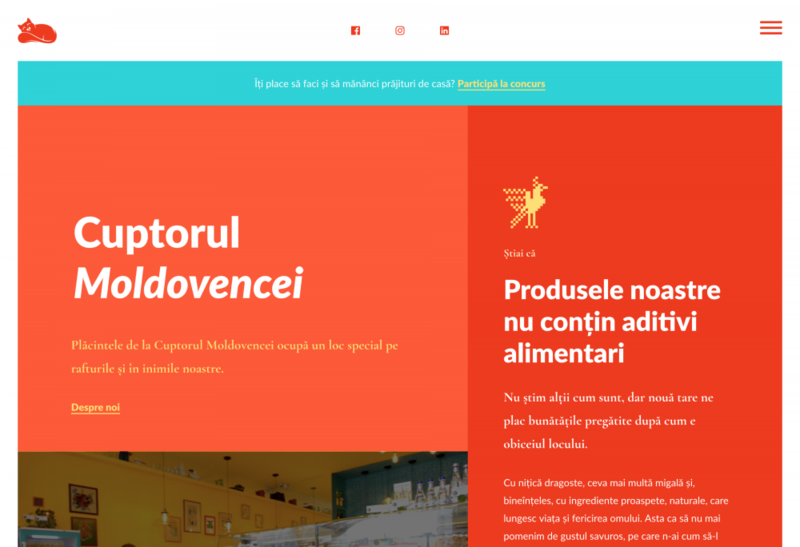 Cuptorul Moldovencei is a responsible bakery chain that cares for families eating healthy and for the enivronment. We think the company will grow nationally in the near future and we’re excited to be a part of that effort!